It is nearing three months since the appalling news first broke out about a Premier first-class match conducted by Sri Lanka Cricket being fixed. The two clubs concerned were Panadura Sports Club and Kalutara Physical and Cultural Club (KPCC) whose Premier League Tier B match played on January 23-25 at the Surrey Village grounds in Maggona stands accused of foul play. The issue unfolded when Sri Lanka Ports Authority CC (SLPACC) who were one of the front runners for the title were deprived of winning it because of the rather unusual circumstances that led to Panadura winning the match outright by three wickets and thus emerging winners of Tier B. At the same time KPCC also benefited as they escaped relegation to a lower division by getting the required runs and points. As it turned out Panadura collected 17.84 points for their outright win and KPCC 5.49 points which was sufficient for them to avoid relegation. KPCC in their first innings scored 390 off 103 overs at the rate of 3.78 runs per over and Panadura replied with 423 off 68.3 overs scoring at the rate of 6.17 runs per over. Where the real twist to the match took place was on the third and final day when KPCC was dismissed in their second innings for 197 off 22.5 overs scoring at 8.62 an over leaving Panadura with the target of 165 for a win. Panadura’s run chase was extraordinary because they chased those runs down in a matter of just 13.4 overs scoring at a staggering rate of 12.21 runs per over. Apart from the unbelievable run rates achieved there was also the mode of dismissals and the manner in which the overs were bowled that led to suspicion that the match was “fixed” for one team to emerge champions and gain promotion to a higher Tier and for other the team to avoid relegation. “It’s a well known fact that something took place during the match but we have to establish the facts. Given fair justice it is obvious that the match has been fixed and the captain of the Panadura team didn’t turn up for the match on the final day,” said Mathivanan. The lengthy period the inquiry has taken has raised doubts in certain quarters that the whole matter would be swept under the carpet as there are key officials of SLC who are members of the two accused clubs also involved. “This inquiry is not like the normal inquiries there are so many people involved - match referee, umpires and Ports Authority who made the complain,” said Mathivanan. “The tournament committee had a preliminary inquiry where I was present and they felt that there is some evidence to probe into this match. They recommended me to go for an independent committee which I did having got the necessary approval from ExCo,” he said. Mathivanan explained the delay in concluding the investigation was due to many factors. “We appointed Chairman of the Disciplinary Committee Asela Rekawa, former national player Jayantha Paranathala and SLC head of Security and Investigations Sarathchandra Liyanage to form the three-member committee. Unfortunately Paranathala fell sick after one inquiry and we brought in Nalinda Illangakoon, a former brigadier from BRC into the independent committee,” said Mathivanan. “They have already led the evidence of a representative from Ports Authority who had made the complaint. But the evidence given by him is not all that strong because he was not there at the match. 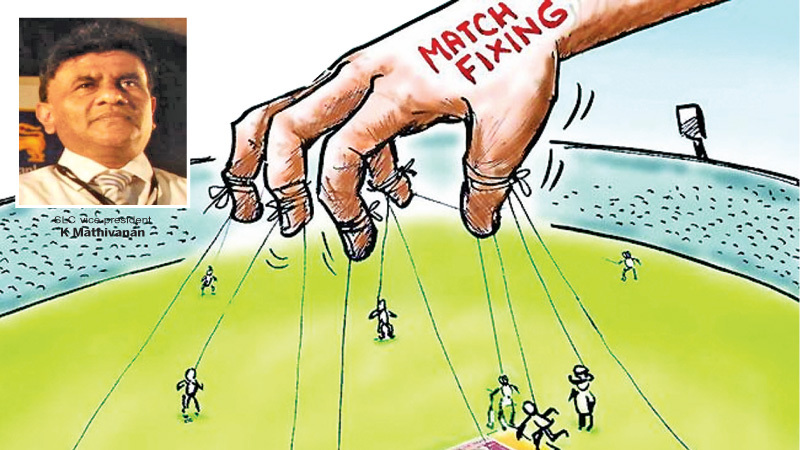 He had only heard about it and they are the party who had been deprived of coming to the top of the table because of this match fixing allegation,” he said. Mathivanan stated that the prosecution is being led by Uchitha Wickramasinghe, a lawyer and Ashley Ratnayake who is assisting him on cricket matters. “I know that there is a time period. Everyone has been hammering at us for delaying the final outcome. But I have been telling them that finally justice will be done and nobody can stop it,” said a determined Mathivanan. “Firstly the complainant, then the tournament committee chairman, the umpire Gamini Dissanayake, match referee SM Faumi and then Asoka de Silva who has also been sent a letter have to be called up to give evidence. With that the inquiry will be over. “The last evidence we led was in the first week of April. There was a spate of holidays and we are resuming inquiries again on April 28. Next week they will have another 2-3 days. By another 6-7 sittings it will be completed. Seven sittings means 4-5 days and with Wesak intervening we are hoping to conclude it by end of May. “We can’t get the witnesses to appear every day because they are also working and these inquiries are held in the evening and can go on for 3-4 hours,” Mathivanan said.